Designed specifically for you, the busy veterinarian, by leaders in clinical practice and pharmacology. It's a new way of sourcing drug information but when you use Vet Drug Index for the first time we think you'll say "of course!" Written from the ground up to contain only the most relevant drug information with full link-outs to PubMed abstracts and a visual evidence-based ranking system to evaluate the strength of the evidence. It’s loaded with all of the helpful features veterinarians have come to expect, including built-in calculators, tips and tricks from the authors called "clinical pearls", detailed expected effects, and relevant clinical pharmacological information for optimizing treatment plans and patient care. Our engineers have taken the very best experiences from the apps you use everyday and created a level of intuitiveness and convenience that simply can't be accomplished in a book. Every treatment recommendation is strictly backed by the best existing peer-reviewed evidence to support its clinical use, including links to PubMed abstracts and a visual evidence based ranking system. Quickly scan helpful tips, comments and clinical pearls from Dr. Côté, Dr. Ettinger and Dr. Schwark for every drug to help you provide a confident treatment plan. The only veterinary drug resource that lists expected effects, so you know what should be the clinical result of the treatment and what the drug actually does. The only veterinary drug resource that provides you with pre-treatment steps at the outset, including pre-treatment medications, required tests and more. Save time with a suite of rapid entry tools that every practitioner needs when looking up drugs, including a basic drug calculator and smart CRI and BSA calculators. 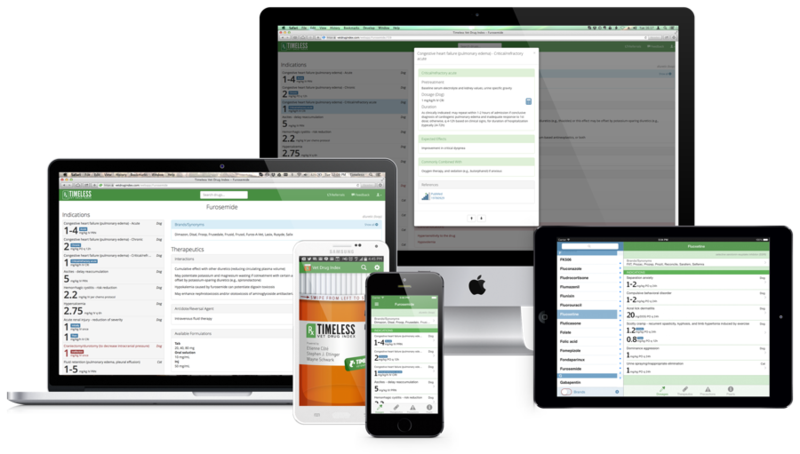 Access the Vet Drug Index on your PC, Mac, clinic workstation, smartphone or tablet. If you’re on the go and unable to connect to Wi-Fi, the Vet Drug Index app is available without the need of an internet connection (and fits in your pocket!). New updates and features are pushed live as soon as they are available at no additional charge to anyone with an active subscription. One subscription to cover all of your devices. Start with a 14-day free trial to see what the Timeless Vet Drug Index is all about. Each subscription allows the Vet Drug Index to be used on two mobile devices as well as viewing access from the web. Not interested in a 1-year subscription? Our month-to-month payment option will allow you to continue using the Vet Drug Index following your free trial without the long-term commitment.